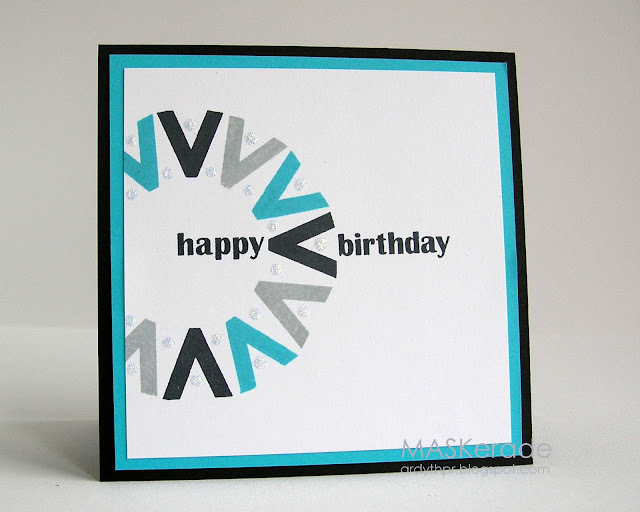 I used MFT's monogram alphabet (V) and an old Stampin' Up sentiment. ETA - to place the v's, I used a reverse mask cut from a circle nestability. I found the centre of the circle (by using the cut out circle folded in half, I laid it on the empty circle twice, drawing the diameter - the centre is where the two diameters meet). Then I just stamped the black ones at 12, 3 and 6 o'clock and filled in the rest. For the sentiment, I used a stampamajig. Okay...so this is totally brilliant!! So cool...what a fabulous way to stretch your stamps! The big circle!! Great masculine colour scheme, and I like how you've placed the sentiment through the circle. Or the circle through the sentiment. Either way, I love it! You did it again! What a brilliant card! And the photo is fine, I would say you don't need to retake it! But I would like to know how you placed those V's so perfectly? And the placement of the sentiment? Just brilliant! You have cool designs well under control Ardyth! Wow! It's wonderful and to think it's a "V" - you are SO creative! Such a clever design! And those colours are perfect together, LoVe it! Thanks so much for joining us this week at CAS(E) this Sketch! Love the colors and the beyond brilliant design! Splitting the sentiment gives the card perfect balance. Thanks for the detailed instructions too! clever! love this great graphic design. thanks so much for playing with CAS(E) this Sketch! How fun you used a V :) Were thinking of mawh? lol -- Fun, graphic card! Great card! How creative to use use the V for your shape...it looks wonderful! I knew it! I figured out your trick before I read about the "V". Very creative, love it! What a brilliant card Ardyth, very clever stamping and fab colours.